Things have been kind of crazy lately in my little world. Between working and moving my mom into her new apartment, I haven't had much time to cook lately. I've been eating out more often lately and taking home leftovers (which I love by the way), so I don't have many recipes to post or talk about. Of course, I'm not complaining about eating out, I love it. My sister and I took my mom out for dinner on Mother's Day and I had a really great dinner. It was a chicken and pasta entree with spinach, sun-dried tomatoes, zucchini and snipped green onions, in a garlic and wine sauce. Ooh la la. It was delicious. Speaking of chicken in a wine sauce... 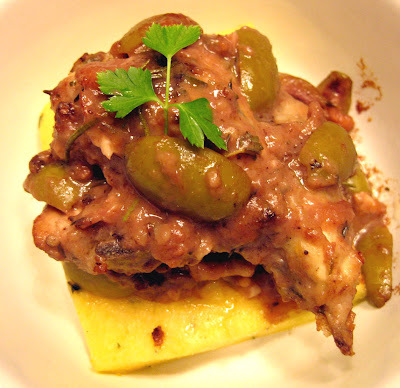 I did make this drunken chicken with olives over polenta squares a few months back and never posted it. The recipe was inspired by Mary Ann Esposito of Ciao Italia. It was very tasty and I really have to make this again (someday when I can think straight again!). Happy Cooking to all of you!! Coarsely chop together the garlic, thyme and rosemary and place in a large zip lock bag. Add the salt, pepper, nutmeg, zest and lemon juice. Add the chicken pieces, zip up bag and shake the bag making sure the marinade covers all of the chicken. Cover and refrigerate for several hours or overnight. Remove chicken from marinade. Set marinade aside and pat chicken dry with thick layer of paper towels. Add the flour to a medium sized paper or plasic bag. Add the chicken and shake until it is evenly coated. Shake off excess flour. Heat the olive oil in a dutch oven or sauté pan large enough to hold the chicken in a single layer. Brown the pieces well on both sides, about 3-5 minutes per side. Add the wine and raise the heat to high. Cook for a minute or two. Add the olives and reserved marinade. Reduce the heat to medium-low, cover the pan, and cook for about 15 minutes. Check for doneness with an instant read thermometor until it reaches at least 165 degrees. Serve the chicken over polenta, potatoes or pasta and top with the olives and pan juices. Yum. love all these flavors. your mothers day dinner does sound phenomenal! care to share the leftovers? ;) i've been saying i need to eat more polenta... although I say that about so many things and only have so much time to cook! This looks really delicious! I've been making a lot of polenta lately, the polenta squares sound like a great complement to the chicken. Oh my gah! This chicken looks absolutely fabulous. What a delicious dish. And you have me totally sold on serving it over those delicious polenta squares. YUMMY!! I'm sorry that I've been an absent commenter; I just finished up my law school exams today!! There's nothing wrong with eating out! I love cooking, but I also love having someone cook for me. This chicken and polenta sounds delicious. Wow, such a great dish...love the red wine in the chicken and the polenta...the picture look so yummie that I can almost taste it. I actually had this faboulas dish before and I cannot wait to have it again,delicioso bambola.